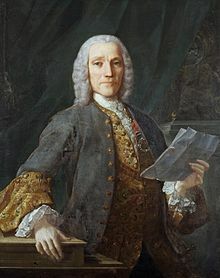 Giuseppe Domenico Scarlatti (born Naples, Italy, 26 October 1685; died Madrid, Spain 23 July 1757) was an Italian composer and harpsichordist. He was the son of the famous composer Alessandro Scarlatti. Part of his life he spent in Venice and Rome. His father Alessandro was a famous composer who wrote many operas. Domenico became famous for his sonatas for harpsichord. He wrote over 550 of them. They are mostly quite short pieces in one movement, most written in an early Classical style, which influenced many future Classical composers. He had some unusual effects in his music such as the crossing of hands as they leap wildly from one end of the keyboard to another. He also liked crunchy chords which sound like the strumming of Spanish guitars. He gave harpsichord lessons to the Infanta Maria Barbara at the Royal Court in Lisbon in Portugal. When she married she took Scarlatti, her harpsichord teacher, with her to Madrid in Spain where he spent the rest of his life. This page was last changed on 9 March 2015, at 02:06.